October is one of my favorite times of the year. The weather is getting cooler in the mornings and evenings and we hold out for hope that the rains will come soon. My neighbor’s kids are getting excited about the upcoming Halloween by decorating their yards with goblins, skeletons and huge fake black spiders and I’ve been purchasing sweets for their arrival at my front door on October 31st. Of course I won’t be baking treats for the youngsters, but their parents might enjoy a little something sweet while trekking through the neighborhood. This is where my apple cake will come in handy. You’re probably wondering what inspired me to prepare this super moist cake. Recently while driving through the countryside of Sonoma County I ran across a farm called Green String Farm along Old Adobe Road in Petaluma. My sister Susan and I were taking my dad to the casino in Santa Rosa when we stumbled across this gem. 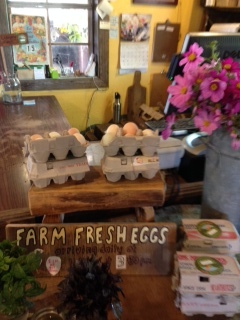 I was happy to learn that they sold local produce, nuts, flowers, olive oil, eggs, cheese, honey and herbs. These establishments are rare where I live in rural Walnut Creek, but are occasionally found in the hills of Petaluma. 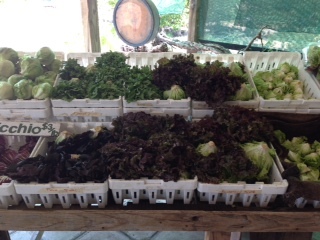 I know how much work goes into growing these vegetables because I have a garden also at my home. Keeping up with the water in the midst of the drought is not a small feat. This is why I appreciate buying from places like Green String Farm. I know my purchase will be fresh and fairly priced. The owner happened to be friendly, answered any questions we had and sent us on our way with a smile. 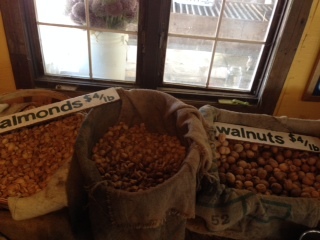 I found their walnuts to be the best I’ve ever tasted. They are sold in bulk by the pound in their shell. Apples pair well with walnuts and it’s the season when I’m in the mood for a warm spice cake. I’ve made this recipe for the past 15 years every time I have an excess of apples and I love serving it with a caramel sauce and Chantilly cream or vanilla ice cream. Luckily, I have plenty of time to bake before the trick or treating begins next week. 4 C sliced apples (3-4 depending on the size. Leave the peels on for more fiber) Granny Smith or Johnagold or your favorite apple. In a medium size heavy saucepan combine the sugar, water and lemon juice. Cook over medium high heat until it turns amber, 6-8 minutes. Do not stir. Tip the pan to ensure even cooking. Do not allow the sugar to burn. When amber color, remove from heat and add cream. Stir with a long handled spoon or whisk until the sauce is smooth and blended. Let sauce cool to warm and use immediately. Can be covered and refrigerated for up to a week. Makes about 1 cup (8 fl oz/250ml). Sprinkle sugar over sliced apples in a large bowl and stir. In another bowl, combine all spices, soda, salt to flour and mix. Add dry ingredients to apples and mix with a wooden spoon. In a separate bowl, measure out oil and add eggs and vanilla and stir. Pour wet ingredients into apples and mix well. Add walnuts and pour evenly into a buttered 13X9 inch pan. Or for a special occasion, pour into separate small ramekins to serve individually. Baking time will be less for these. Bake in a preheated 350 degree oven for 40-50 minutes until a tooth pick comes out clean. Serve alongside caramel sauce,and a scoop of vanilla ice cream or whipped cream. It’s October and I’m reminded of the tastes and aromas of autumn. 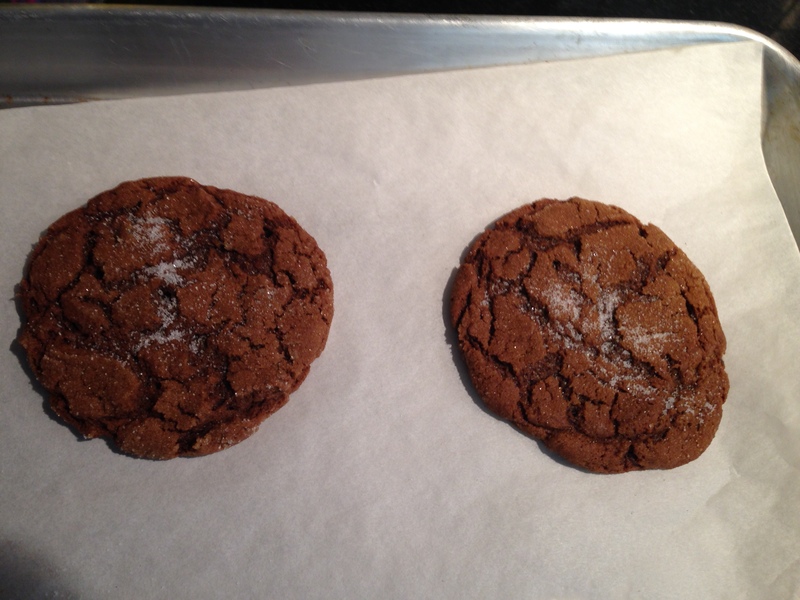 I remember my grandma Leone make these decadent ginger cookies when I was a young girl. 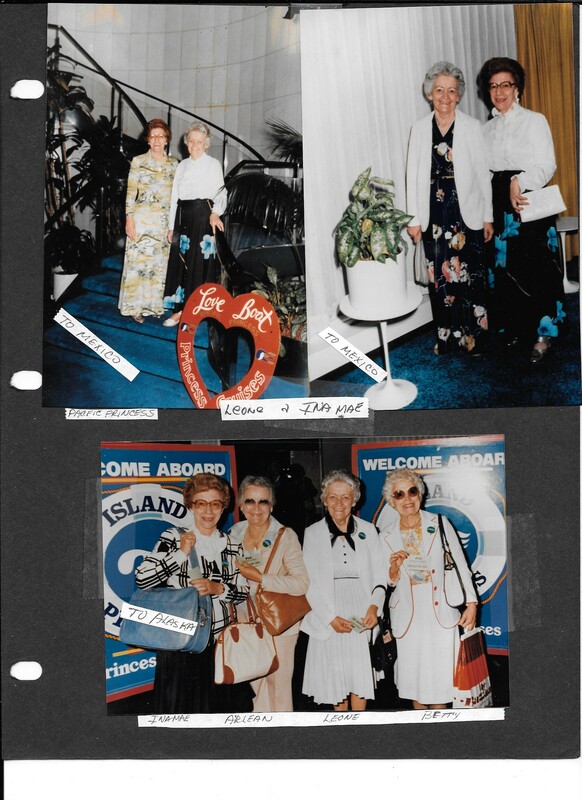 Here is a picture of her traveling with her sisters on one of the many cruises she would take. There is nothing better than smelling fresh ginger and cinnamon baking in the oven. The one thing you must do when making this cookie is to add fresh and candied ginger to the recipe before baking. This one extra tip will make you aware of your senses when waiting for them to pop out of the oven. I’m a huge fan of eating these one or two of these cookies when I’m hungry in between meals. I did just that yesterday when my husband and I were on our way home from visiting my 83 year old uncle Joe at the nursing home in Morgan Hill California. He is recovering from an abdominal surgery, but is on the road to wellness thanks to his son and my cousin David who has constantly been by his side. David has stepped up big time in aiding his dad while healing from what was supposed to be a quick fix of a hernia, but ended up being more involved and a more serious than expected procedure. When I visited Joe a month ago he was weak and not eating. Today he has regained much of his energy and is getting stronger every day. 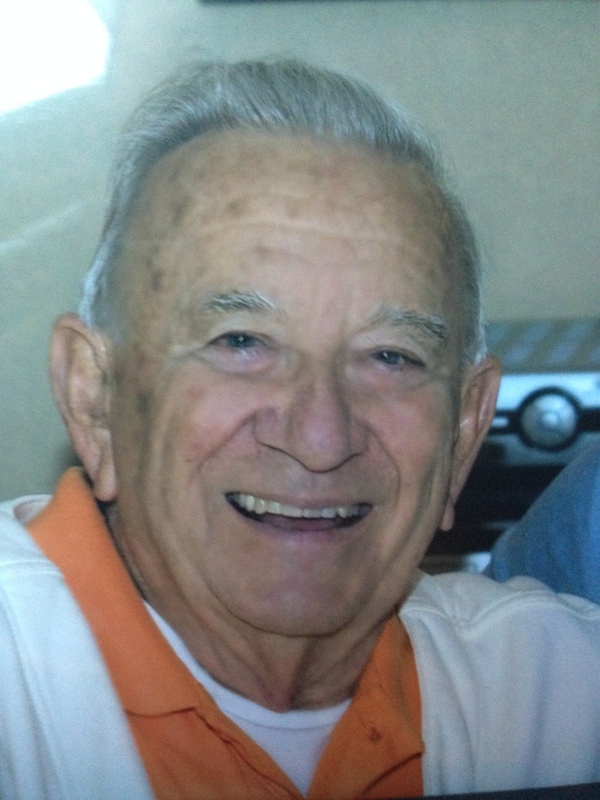 Uncle Joe is the patriarch of the family and is sometimes referred to “The Italian Stallion or “The God Father.” He would normally be smelling of Brut cologne and even after a hug, you might find yourself smelling like Brut also. Arg! Uncle Joe was the photographer of the family and has tons of slides, videos and photos of the Morabito, Caprasecca and Seamon family. We are ever so grateful for all the hours of photo taking he has done and kept safe over the past fifty years. During my visit yesterday, I wish I would have thought to give him the ginger cookies that I had stashed in my purse. I didn’t realize I had them until our long car ride home when I was rifling through my purse looking for a mint. How excited I was to bite into this chewy and cinnamony and gingery cookie. Yum! Those two cookies made the Bay Area Sunday night traffic bearable. Next visit I will make his favorite. He mentioned he likes oatmeal raisin cookies. Maybe next time I will find him back at his home with Aunt Nancy and Streak his black lab dog. Cream together both shortenings, sugar, molasses until blended. Add one egg at a time and scrape bowl in between. In a separate bowl place flour, baking soda, baking powder, salt, and spices and stir together until combined. Mix into molasses mixture in small batches until combined. Form into small balls, Roll into granulated sugar and place onto greased sheet pan or parchment covered sheet pan 2 inches apart. Place into freezer until cold for @ 15 minutes. Bake in 375 degree oven about 10-12 minutes. Cool on pan. Makes about 10 dozen. Cut recipe in half if you only need a few, but I make a lot for future cookie enjoying.